oops, sorry. I thought I had put them in the post, but not. I'll check them later. It would be quite something to address this with an O-ring! You could try Earl's Conical Seals, they are a thin metal conical shaped seal that fit over the cone of the AN fitting, used to take up wear for frequently dismantled items. They are called up on some helicopter engines as standard fit. I am sure you will find more on the web, and possibly other manufacturers. I am supposing this means I can't just put an O-ring in there from the later model V11? It may be that you can't add the o-ring. Or maybe you can. O-rings are cheap enough, it could be worth trying. I keep an assortment of o-rings around. I would look at the fitting and see why it is leaking at your next oil change, unless it is leaking so much that you need to address it now. Once you can figure out why / where it is leaking from it should just be a matter of addressing the issue. If it is a flared fitting you may be able to use the conical seals mentioned above. Or it may just need cleaning. But if it is cracked you may need to replace parts. In my opinion that line is way overkill. It is way more line than you need. It is not holding any pressure to speak of (unless your crankcase vent isn't venting). It should not take much to make it leak free. The leak is minor, more of an annoyance. More annoying after I have addressed all of the other (many) leaks of all sorts. I am toying with the idea of making a little mess removing the line and maybe capping the "reduction" sump adapter to get a look at the connection. Seems if I am going to buy parts, I would get the later "upgraded" line and adapter with the O-ring. After all, I am slowly turning my early Sport into a 2003 Argento Corsa. Thanks to footgoose for the photo of the return line from a 2003 Rosso Corsa! The washer on the Banjo bolt appears to be a Dowty washer . This should have one on each side of the banjo fitting . The o-rings on the other fitting may / may not have a MG part # . Go to a store that sells hydraulic fittings . e.g. Parker , Gates , etc . and ask them for help . Make sure they know this is metric stuff. Yep, the late model V11 parts fiche shows two (2) of those O-rings (as pictured). I did not notice the x2 quantity before. The early line, and its sump adapter, are different, apparently. Going off of memory (which at my age can be dangerous), my Daytona has a metal twin hose fitting that attaches with a banjo bolt. I thought the wifes V11 (a 2001 as I recall) has a single line to an AN style fitting. I was just in the garage a bunch over the weekend working on the Jeep. But I didn't take a look at the V11. Maybe I can get to it soon. So, AN and JIC fittings cannot be discerned from one another by simple visual inspection? And, is there a name for the fitting with the two O-rings as fitted to the later V11 and shown in post# 36? The difference is the thread "machined quality". Plus the fact they are about 4-5 Xs the cost . AN are military and probably aircraft use only . These other fittings with paired O-rings, I'm not sure, will take a few minutes to find. HTH I remember Ford used this setup on their A/C garter spring fittings . Here is this, Gentlemen: If you need to source or replace this line, the early "flare fitting" line has a "shoulder" that captures the hex fastener. Later "O-ring" lines allow the hex to slip back over the 90º bend (as shown above) . . . 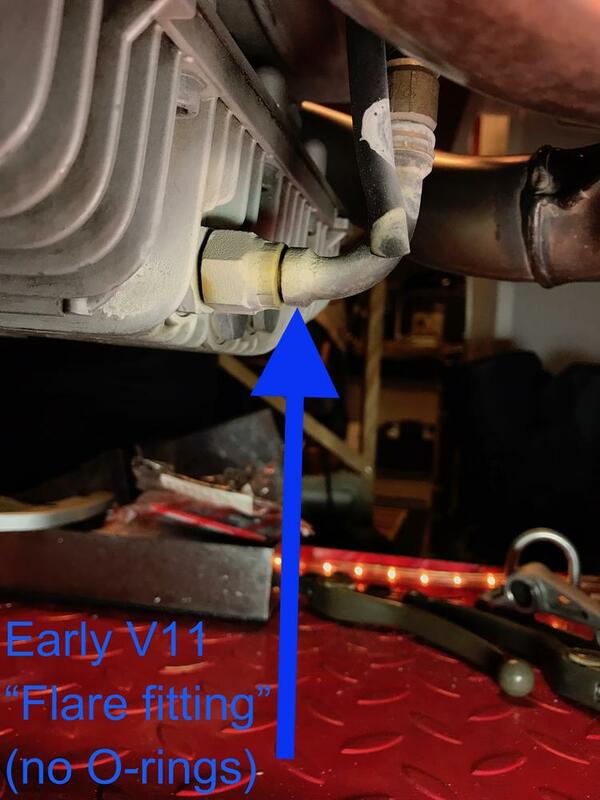 I am seeing that the oil cooler lines' fitting type also changed in the later V11 from the "compression/flare" fitting to the double O-rings. Along with the matching "reduction" fitting.